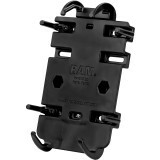 Steve6 - Indiana Excellent "I have used one of this Ram mounts for the last couple of years on my Streetglide. Works great, never had a problem until my HD shop broke it. New one works great." Stevenwendy - Spokane Not as shown/advertised "Item came with black screws/bolts not chrome as shown"